The author looking back at the route. 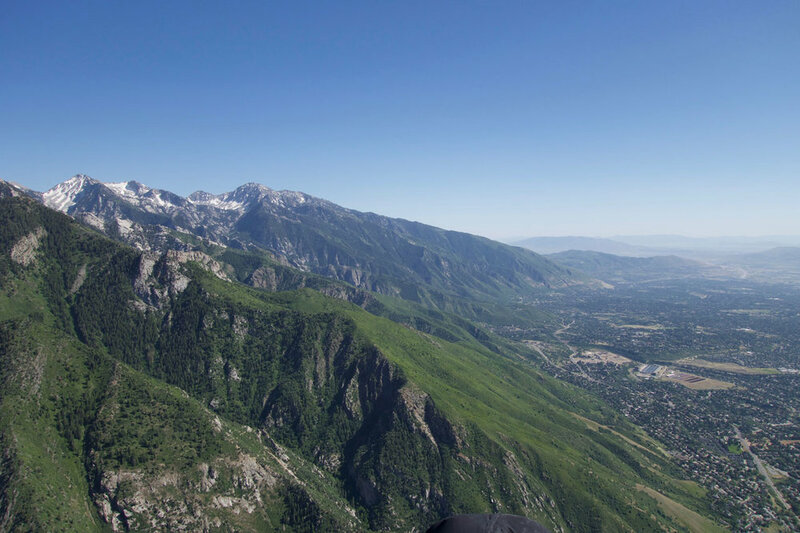 June 11th 2018, two New England pilots had a memorable day of flying in the Wasatch Mountains. It came about when I traveled from my native Vermont to Utah for a wedding on the edge of the Capitol Reef National Park. 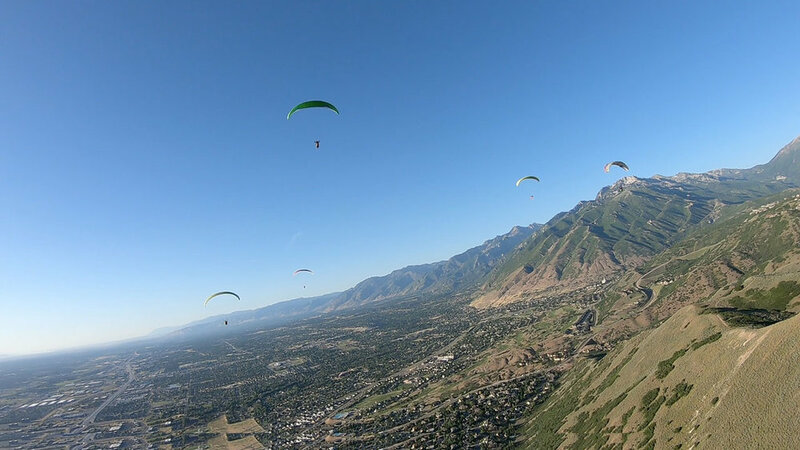 If you’re reading this, you understand that flying in and out of Salt Lake City obligates taking a paraglider. This fever is contagious, so my friend Ryan Dunn decided to join. It was a short trip, arriving on Thursday and returning on Tuesday. We flew everyday thanks to my shameless ducking of the Friday wedding dinner to fly a new site, The V. This skulduggery also enabled an amazing soaring session the next morning at the S. Side of the Point of the Mountain, making it well worth the ribbing I got from those who noticed my absence. But this is a story about just one day of flying. On the last day of our trip, when faced with a marginal forecast, we made big plans and executed them perfectly; it was a big day for the Yanks! The author’s wingtip, dawn patrol. The day started at 4:45AM. Like a child on Christmas morning, I’d woken before my alarm. We were in position at the S. Side of the Point of the Mountain just before the sun came up, enabling my 3+ hour rendition of kid-in-the-candy-shop. There’s ridge soaring in Vermont, but none with the ability to “interact” with the terrain. And interact I did. Sliding around the gravel ridgetop wearing a huge smile, I did as many touch-and-go flights as possible. Must have been over 150. Some wings just feel like home the moment you fly them and that was the case for the new 25m BGD Punk I had picked up in SLC a few days earlier. Feeling confident, I invented several games for myself: The Yo-yo~ launching hard, flying up a few feet, getting really deep in the bakes to drift backwards, accelerating, swooping, touching the ground, climbing out and repeating. The Hovercraft~ flying in one spot trying to maintain 12” off the dirt, remarkably challenging. The Dolphin~ getting 15' up, slowing the glider down, diving at the ground to kick the grass, using the energy to climb back up and repeat. The Dirt Squirrel~ Torpedo to belly slide on a piece of carpet, stop and kite, then fly away. Like I said, kid in a candy shop. 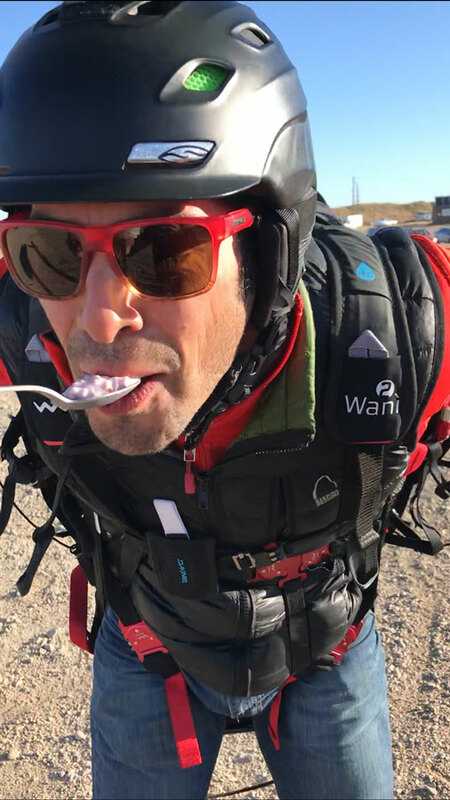 Fly-thru breakfast, the author snags a spoonful of yogurt from a friend during the a.m. soaring session. Calef ground handling, photo Ryan Dunn. As the sun got higher, the Point transitioned to windier, more thermic conditions. The crowd thinned and mini-wings started to soar. I downsized to a 20m Gradient Freestyle 3, which is a good bit faster than the 25m Punk. The last 45 minutes were spent seeing how low I could soar without sinking out. Several times I had to sidehill land and kite back up to relaunch in the lift band. The little 20m Freestyle 3 is fantastically fun, but there's no escaping that I downsized because the air was getting stronger and more turbulent than I cared for. The candy shop had closed for the morning. I packed up watching the handful of diehard (foolhardy?) full sized gliders still in the air. Their unchecked pitch movements outed them as rookies. Were they uncomfortable? Probably not. Perhaps they should have been. I smiled recalling that a dozen years earlier I had done that exact same thing at this site and enjoyed every minute of it. Funny how the longer I fly, the easier I spook. Loading gear back into our respective vehicles, Ryan told me to meet him at the North Side of the Point as he intended to leave his truck there. He had a plan: We were going to drive up to Bountiful and launch off The V. Then we would make the 30 mile cross country flight back to the Point. I laughed at this bold plan and expressed doubt. Ryan smiled and said, “It’s a classic local SLC route. I’ve wanted to do it for years.” Goal had been declared and shuttle was set. Over breakfast burritos we joked about this lofty goal. Ryan’s brief synopsis of the weather forecast included high pressure thermals at 600fpm, wind less than 10 MPH NW down low and stronger above 10,000’. It would not be a classic high SLC day, but certainly flyable, and probably for the best as we were not acclimated to altitude and did not have have oxygen systems. It was our last day and we had yet to do any midday flying, so despite the marginal forecast we would give it a try. I'll sheepishly admit I didn't actually look at the weather myself, relying completely on Ryan's forecasting. Fail. Always check the weather yourself. We drove to launch where we met Ryan’s local friend, Pastor Dan the Soaring Man. As the nickname (I made it up before even meeting him) would imply, he was excited to join our XC mission. On launch I was immediately apprehensive of the 5-12 mph Wasatch hair dryer. But it was coming straight in and it did not feel gusty or sharp. Spring had not been kind to us in New England and standing on launch I remembered I had not enjoyed a productive thermal flight since…? It must have been Mexico 6 months earlier. Tisk tisk. Did I really want to launch at 2PM in the Wasatch, on new gear, at a site I had only flown once before? Ryan had none of these hang-ups and started setting up his gear. Following the classic “looks good you go first” protocol, I prepared directly behind him. Ryan launched into what appeared to be smooth lift. FOMO (fear of missing out) quickly bested trepidation and I was airborne 30 seconds later. Ryan captures the moment just prior to launch with Dan and Calef suiting up. Ryan quickly started making tight 360’s. I seemed to have missed the best of it. Or maybe I was just being more conservative. Whatever the cause, I fumbled with figure-eights against the terrain as Ryan specked out. I was still digging myself out from below launch when Ryan came across the radio, “It’s great all the way to 9,500’, I’ll wait for you guys to get up so we can head out together.” He was over 3,000’ above me. Far too busy to reply, I silently thanked his patience and optimism. 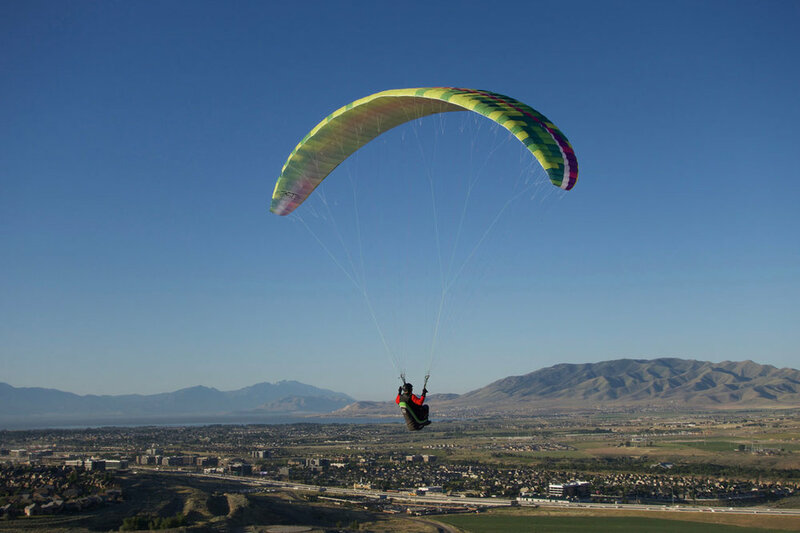 Calef soaring above the “V” launch with the Great Salt Lake in the distance, photo Ryan Dunn. Ten minutes later I found my ride out while Pastor Dan sorted out some gear challenges on launch. In that first productive thermal I familiarized myself with the new equipment. The Punk let me know when she needed more or less reins, so I was able to keep the colorful bag-wing overhead and inflated with minimal effort. She spoke in a different dialect than my familiar friend, the Advance Sigma 10, but the Punk and I quickly clarified the nuances of our communication. Eager to do the work, her responsive handling enabled me to hook onto the small, strong bubbles that wanted to spit you out. It was tricky and technical climbing, but we were gaining altitude. Thanks to a favorable lapse rate, the thermal just got better. Dan got in the air just as my trusty Flymaster LIVE lit up with a siren informing me I was fast approaching controlled airspace. Having worked so hard to get up and not knowing if my new friend Dan would be so lucky, I figured I better get moving. This was an easy decision as the bailout LZ’s looked better to the South. Still avoiding airspace, I flew through lift on much of the glide to a nice ramp shaped mountain pointed into the wind. This known thermal trigger was the only feature we had discussed on our “route planning”. Ryan and I arrived high and drifted overtop, circling in broken lift. From there I could see the next move was to cut across a 5 mile wide swath of ridges and canyons that defined the Northern end of Salt Lake City. I hoped to glide right over that mess of terrain, but was I high enough? When I encountered widespread sink, the answer became clear, so I did an about face and stuffed the speed bar racing back to the windwards face. Ryan followed. This afforded Dan the opportunity to catch up with us again. Together the three of us worked two or three thermal bubbles before I found one I thought was worth going over the back with. Ryan followed, but Dan flew out front looking for another thermal. Drifting downwind, circling in light lift above a mess of dramatic ridges and valleys I cogitated on my homegrown philosophy, The Way of the Butterfly. Be the butterfly, content to blow downwind, circling in everything that goes up. The author captures the moment preparing to transition towards Salt Lake City just beyond the foreground ridge-line. By time the lift completely dissipated, we were in great position to punch into the main valley. The Butterfly Method had worked like a charm. Now we were truly running and gunning, without a plan. That appealed to me, like kayaking challenging new whitewater without scouting. Both practices seem overwhelming when considering entire task, but manageable when broken down into many small decisions. They key is to always keep a suitable “out”. Easier said than done on the edge of congested Salt Lake City. At times the bailout options were not much better than a grassy sidehill-landing with a garnish of power line dodging. But I bet if you pay them $2, the rattlesnakes would pack your glider. Good reason to stay high and keep moving towards the one good LZ I knew of, the N. Side of the Point of the Mountain. As we went south, the mountains got even more impressive. I’ve flown in the Rockies, Alps and the Andes, but I must have gone to the wrong sites because they had nothing on the dramatic and rugged Wasatch Mountains that bordered this metropolis. The impressive terrain afforded plenty of big sunny faces propped into the wind. These bridges worked reliably, giving up more broken, scrappy thermals. Ryan and I got separated when I engaged butterfly mode, turning in drifting lift while he raced ahead only to get pounded in sink. He worked to dig himself out as I bobbed along high, easily skipping across the next few valleys. Everything was lovely until I butterflied my way into the tractor beam of the big valley where I-80 goes up to Park City. Approaching 11,000’ (the highest I got for the day) things got turbulent (wind shear) and I found myself drifting North East. Huh? Southwest winds? That wasn’t in the forecast I had… um… not looked at. Fail. I abandoned my thermal and focused on escaping the draw of the valley. Tacking across the windy gap I did breathing exercises discussed on Cloudbase Mayhem. Four second breath in, four second breath out, for four times. Embarrassingly, I had to restart several times when I got distracted keeping the bag inflated. Turns out wind and turbulence as you’re fighting to avoid getting sucked into the mountains is a great time to work on mindfulness and relaxation. I still had a long ways to go and could not afford to stress out staring at my vario, which occasionally indicated a dismal 2:1 glide ratio. But eventually persistence and patience were rewarded as I got across the valley with plenty of height to latch onto the next windward face. Ryan captures the moment approaching the summit of Mt. Olympus. As I tanked up again, Ryan came across the radio to announce he was also crossing I-80, lower, out front. I was excited to hear he was still in the game after his tour of the fine homes on the Salt Lake City foothills. But surely he could not survive a low crossing, could he? I worked a few bubbles of lift before making the decision to glide at Mt. Olympus. That giant hunk of rock I actually knew the name of as I had stared at it longingly from the ground while visiting a friend the day before. Landing options were slim, but I had plenty of height and was confident that the prominent mountain jutting into the wind would work. Well before I got to Olympus I found relatively smooth, widespread lift. Circling, I tried to pick out my friend’s house. Over Mt. Olympus I banged into that darned wind-sheer. The thermals got rowdy as the wind shifted to SW, drifting me the wrong way again. Drat! But I just waited there as Ryan had also reached Olympus and quickly boosted up to my altitude. Back in the game, well done Ryan! We moved on. Crossing Big Cottonwood Canyon with Lone Peak summit (center) and North Side of Point of The Mountain (right) in the distance, photo Ryan Dunn. With the sun lower in the horizon a sense of urgency set in. We worked as a team with the top pilot leaving the thermal first to find the next one and this enabled us to move more quickly. We continued to fly over incredibly impressive terrain that I didn’t have the guts to photograph as I was too busy keeping the bagwing inflated. 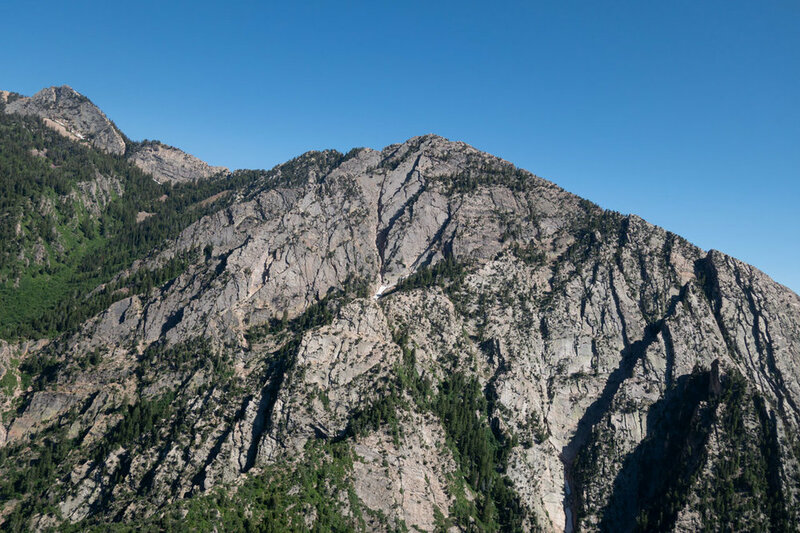 After crossing Big Cottonwood and Little Cottonwood Canyons we reached the last big mountain on our journey, later identified as Lone Peak. Concerned about the final big valley crossing, I took my time and tanked up altitude. When I was confident I had goal on glide, I turned and made the big valley crossing. Again I was impressed with how lovely the Punk flies on bar. Approaching the Point of the Mountain I was greeted by the strongest and most copious lift of the entire flight. It was too rowdy to want to stay just to play, plus I had to urinate badly. So I ignored my own advice to stay up as long as there are thermal to avoid forcing yourself into a hot, dangerous LZ and spiraled down in front of what felt like 100 waiting for the conditions to calm down before launching. Not used to performing for an audience, I was conscious of the many eyes on me. It was windy and moderately turbulent. Style be damned, I got out of my harness 100’ up, ready for the worst if I needed a PLF. That wasn’t necessary and I executed an uneventful landing as close to the bathrooms as possible. The author soaring up the flanks of Lone Peak, photo Ryan Dunn. Goal! We had not enjoyed an easy flight; conditions had not been particularly great. We did not get any moonshot -super high thermals- or long, carefree glides. Heck, we typically have more ground clearance in New England XC... But the terrain was spectacular! And there’s something satisfying about making it work against the odds in marginal conditions. My next task was to find Ryan. I dug out my phone and read his text, “I landed less than a mile short. Here’s the pin. Come get me when you can.” Bummer. He’d pulled off an incredible flight, but just came up short on the final move. I packed up and then jumped in the car he had had the foresight to leave for us. Well done Ryan! It felt like so long ago when we had grubbed on breakfast burritos and joked of trifecta, South Side, The V to the North Side, and finally a North Side glass-off. The laughable fantasy was now easily within grasp… but I was utterly exhausted, dehydrated (I had not flown with a Camelback), hungry (or food), and was not excited to get back into the rowdy air I had just spiralled out of. I just wanted to relax for a bit before driving to retrieve my rental car, 30 miles north in Bountiful. Eight hours of airtime was plenty for one day. As I watched the aerial circus, I felt like a country bumpkin just arrived in the big city. So much paraglider traffic! In no condition to throw elbows in traffic, I was content just watching… But the Point of the Mountain has a certain magic to it. Quickly the air got noticeably smoother. The crowd thinned out as more and more pilots “benched up” to the upper slope. It wasn’t long before my flight lust returned and I was in the air. “Just a quickie” I told myself as I easily benched up and proceeded to chase my friends around with my brakes in one hand and a selfie stick in the other. After about 40 minutes Ryan announced on the radio that he had flown back to where he landed, then back to the Point. He had completed the journey. Count that as win. Good timing too as our drive wasn’t getting any shorter while enjoying the sunset in the sky. So we landed and celebrated with a big high-five before doing vehicle retrieve hokey pokey. Ending the day with blissful soaring at the North Side Point of The Mountain. At 11:30 PM I had my hardest landing of the day, belly flopping into bed. We had racked up around eight hours and forty five minutes of flight time, a full day of work. Not bad on 6 hours of sleep. No single flight was my longest, highest or farthest, but combined it was the most hours I had flown in one day. I’ve never flown comps and I don’t normally “declare goal”, so it was definitely my longest flight to a declared goal. Perhaps most impressive, we had pulled off a super fun XC flight in the Wasatch when apparently nobody else had flown XC that day. Wait, is that impressive or foolhearty? I was left with more questions than answers: Which of my decisions were good and which were poor decisions that resulted in nothing bad? What were my areas for improvement? I’d bent many rules ~ I had launched with new gear at a new site in the middle of the day. I did not check the weather, relying on a friend’s forecast. I had not scouted the route. And this was all sprinkled on a bed of rusty skills~ but it all ended great. Did the ends justify the means? The stench of hubris snapped reality into focus: We’d been opportunistic. We’d robbed the bank and gotten lucky. Our success should not embolden us to take those risks again as repeat success was anything but guaranteed. No doubt many things could have been better executed, but I could not tell you what. I don’t know what I don’t know. What I do know is we had a memorable day; it was a a big day for the Yanks! Thanks Utah! We can’t wait to come back.